The clock really was ticking on this so-called economic boom. A product in many economic accounts of Keynesian-type fantasy, the destructive effects of last year’s hurricanes in sharp contrast to this year’s (which haven’t yet registered a direct hit on a major metropolitan area or areas, as was the case with Harvey and Irma) meant both a temporary rebound birthed by rebuilding as well as an expiration date for those efforts.  In short, starting with the month of September 2018, annual comparisons would be compared with the aftermath. As noted at last month’s retail sales report, the results for August 2018 would be the last under the “boom.” Today’s report for September shows that, sure enough, there was no boom at least not one that wasn’t blown up onshore by Mother Nature. Consumer spending isn’t really falling off, rather it is being estimated properly again for the first time in a year. It’s not that the economy may be slowing, though there’s enough of that in the details, it’s that the boom never was. Not really. In three out of the prior four months before September, total retail sales had grown by nearly 7% year-over-year in each; and in the fourth, by a bit less than 6%. The combination of gasoline prices plus last year’s reconstruction around the Gulf of Mexico may have made it seem consumer spending was picking up from the persistently awful economic conditions indicated right up until Harvey arrived in late August 2017. In September 2018, by contrast, retail sales rose by just 3.12% – which is a level you would find during mild recession. This will no doubt be blamed on recent hurricane activity and landfalls, but in August 2017 retail sales managed to grow by 4.14% despite a top 5 US metro area being covered by a biblical level of floodwaters. This one account, surely to be followed by others, is reverting back to type now that the annuals are equalizing. That type more closely resembles the labor market, meaning the full suite of statistics outside the unemployment rate, those showing wages still historically stagnant and incomes sluggish since the last downturn that struck now three years ago. If any economy like this requires such massive tropical interference to appear even marginally functional, meaning only a little better than the upturn in 2014, it is not a healthy one by any honest definition. Gasoline sales were up “just” 10% in September, not quite as nauseating (for consumers) as the 20%+ gains over the past few months. What that meant was retail sales excluding gasoline were shockingly weak last month. Year-over-year, excluding those sales recorded by gas stations, retail sales rose by just 2.76%. That’s the lowest in a year and a half going back to February 2017. Restaurant sales were down in September on a seasonally adjusted basis, which many are pointing out as the work of Florence over the Carolinas. Perhaps, but this is, again, not just the one month displaying warnings about the state of consumers and the overall economy. The trend is only continuing in September, meaning that any hurricane’s impact is in the same direction as the re-emerging weak economy that’s been there all along. 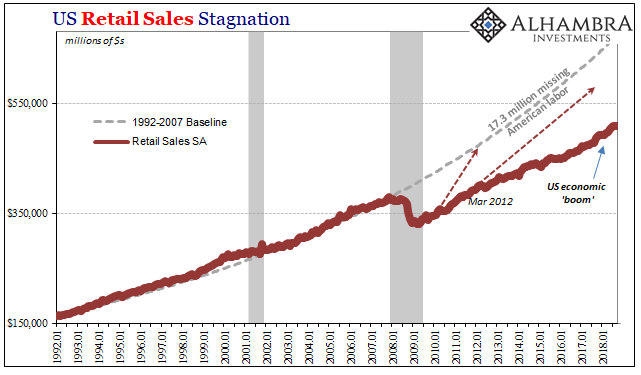 All retail sales, including gasoline station sales, are up just 1% total since May 2018. In those four months, that works out to a recession-like 3.1% annual rate. Florence showed up only at that end of the period. 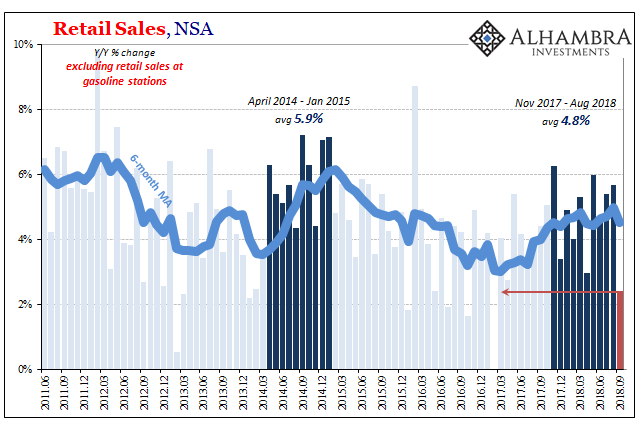 Excluding gasoline, retail sales rose by less than a 3% annual rate in those same months. 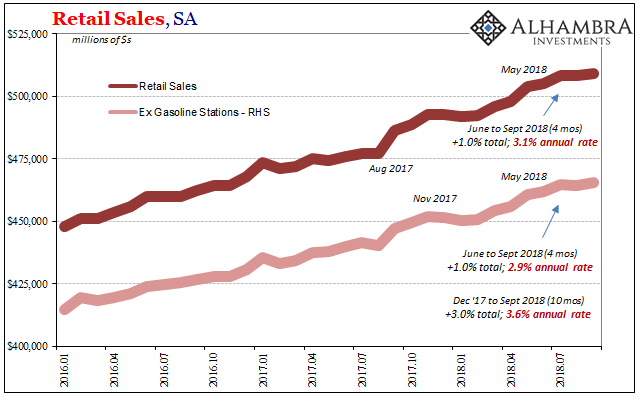 Going back to last November, and the final inputs from Harvey and Irma cleanup, retail sales ex gasoline have gained a paltry 3% increase, just 3.6% at an annual rate for all of 2018 plus last December. Where are the tax cuts, then? Tax reform was supposed to be a massive contribution to especially workers, the narrative basis for this year’s presumed boom. There is no doubt that take-home pay is up because of them, but consumers are clearly not spending as if they see them as significant; perhaps, simplest of all explanations, because they can’t see them that way. The economy isn’t booming, it hasn’t been booming, and now there are clouds gathering (or perhaps having arrived already) to press this condition even further over the months ahead. One of those has to be the auto market. Sales have, as one Ford executive predicted way back in 2016, plateaued. That at first left a massive imbalance in inventory that has largely, or to some degree substantially, been worked through in the more than three years since the inflection in the automobile market. Yet, production has kept lagging because both the absence of a clear signal consumer demand is picking up at the same time downside risks are surely on the minds of carmakers. September 2018 retail sales can’t have helped, which in this view shows auto sales contracting by 1.4%. It is the first minus sign for this segment since August 2010. Only part of that result can be traced to base effects, the rebound of auto sales in September 2017 especially in and around Houston. 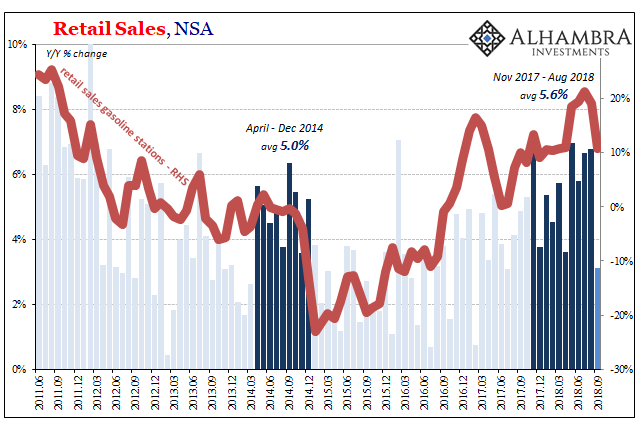 Instead, as many dealers will tell you if you happen to ask, consumers are staying away from cars in particular now that 0% financing has almost completely vanished. Consumers that are in fact doing well won’t refrain from buying autos simply because the payments for them increase by a relatively small factor. Small changes that lead to outsized results indicate something else going on performing the amplification. It’s been this way all year, and even last year, too, except that for a few months tropical clouds made enough of a mess that, pace Frederic Bastiat, impoverishment looked like the economic miracle underpinning inflation hysteria. The miracle is gone as is the general hysteria, leaving only the impoverishment and a very different set of clouds. 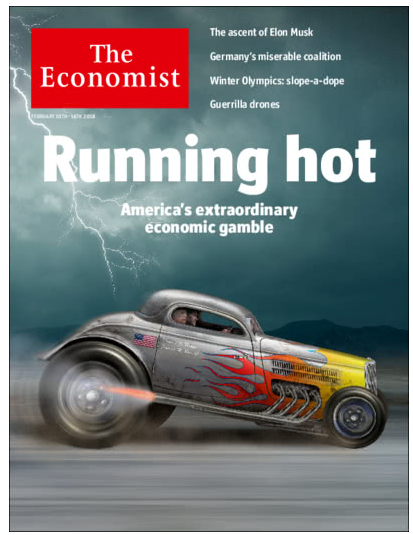 The US economy is booming, except that it wasn’t.